You are here: Home / Blog / Wine with Winston / Springtime in the Vineyard! Oh boy, oh boy! Spring is my favorite time of year. The country air is always full of good smells: flowers, freshly cut grass, manure being spread over the fields, and burger being grilled for dinner. I could tell you which one of those is my favorite, but you probably already know! What more could a dog ask for then a freshly grilled burger to be followed by a good nap in the freshly mowed grass? Phew. Tell that to my Mom. Please! Luckily for me, fun in the vineyard doesn’t just end with delicious smells; instead, it is a time of excitement when the vines are coming back to life and plans are being put into place for the next year. Gene, along with Felix’s crew, has been working hard the last month to prune all of our vines back from last year and train them to the trellis for this year’s crop. Pruning grape vines should be done pretty aggressively by cutting up to 90% of the previous year’s growth off. Then, adequate pruning is imperative to ensure a bountiful harvest. 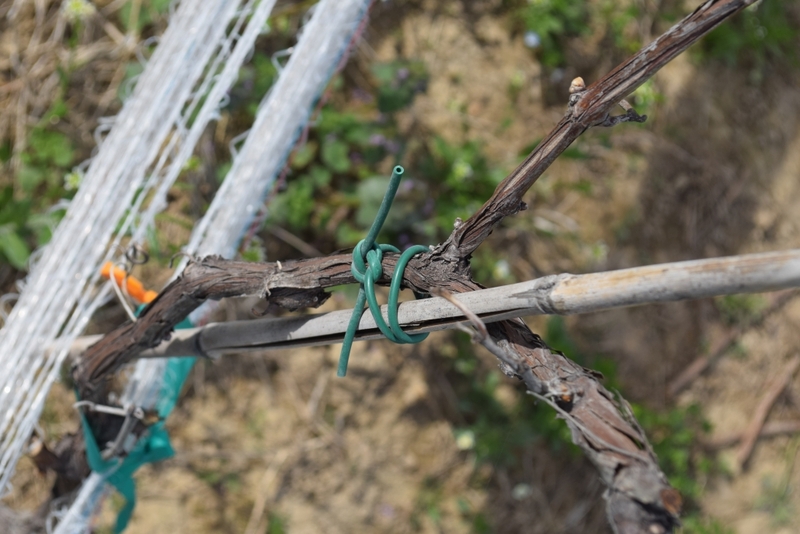 Grapes only grow on new growth, and the new growth comes from the previous year’s vine that has been wired onto the trellis. Each plant, when finished being pruned, should have about 20-30 buds remaining on the entire plant. Achieving the proper balance of buds is so important to having a large crop. Too many buds and there will be too much canopy and not enough sunlight reaching the vines; too few buds and the crop load will be less than desired projections. The lack of fruit can encourage excessive greenery growth that also leads to too much canopy. It is a delicate balance that can only be achieved with foresight, intuition, and a knowledge of growth patterns of the different vinifera and hybrids. Vineyard managers are a huge asset to the winemaking process and their work often goes unnoticed if you aren’t looking closely. 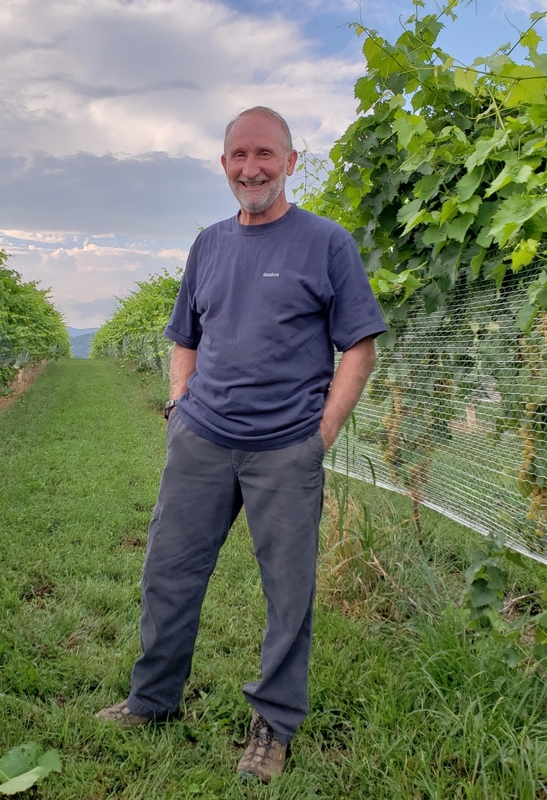 Luckily for us, we appreciate Gene and all of the work he does: Thank you, Gene, for looking out for our vines and for giving me ear rubs whenever you come around. 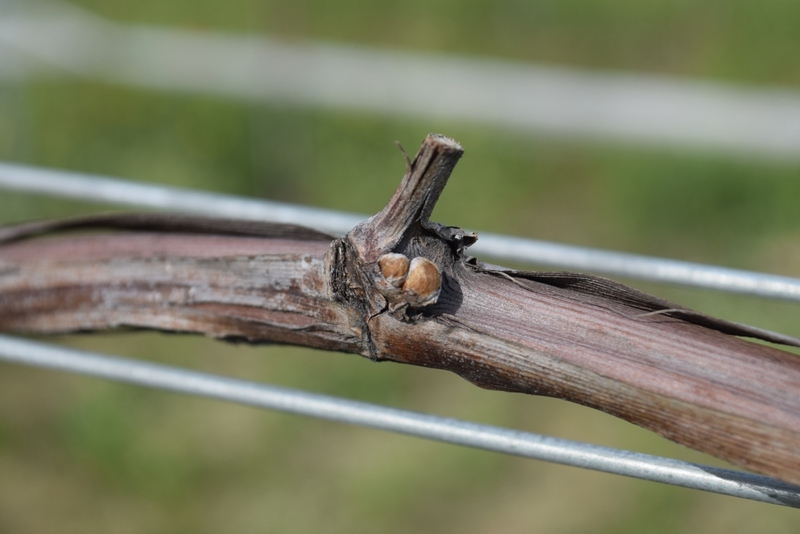 As you all come into the vineyard over the next few weeks, keep your eyes peeled for bud break. This exciting day is when the growing buds bust through their winter blankets and start to show their green-gold selves to this world! We will share that breaking news when it happens!